England striker Wayne Rooney's ban for the Euro 2012 Championship has been reduced to two matches from three after an appeal to Uefa in Switzerland. He was punished after being sent off for kicking Miodrag Dzudovic during a 2-2 draw with Montenegro in October. Rooney, 26, will now be available for England's third Group D game, against joint hosts Ukraine, but will miss the fixtures against France and Sweden. The third match of his ban has been suspended for four years. A Uefa spokesman told BBC Sport the third game ban would kick in only if he is sent off for violent conduct in another European Championship match. "The ban applies only to national team competition governed by Uefa," said the spokesman. Rooney has also agreed to do one day of community service with a Uefa project. England manager Fabio Capello joined Rooney for the 90-minute hearing before a three-man appeals panel on Thursday morning. The Manchester United forward travelled to Nyon for the appeal after his club's shock Champions League exit at FC Basel on Wednesday. Adrian Bevington, the Football Association director of communications and Club England managing director, said: "We've had a very fair hearing. "Wayne and Fabio are both very pleased. Wayne will head back to Manchester as a matter of priority. "Wayne has always made clear that he accepted it was a red card offence. "We arrived with the possibility of him missing the entire group phase - it would have been a huge challenge for Fabio and the team, so to have him available for the final group march against Ukraine is clearly very positive." It is believed the FA argued a three-match ban that affects games in the finals of a major tournament is a harsher sanction than a suspension of a similar length which would just affect qualifying games. The appeal included a written letter by Dzudovic asking that the ban be reduced and the FA sent a team including Adam Lewis QC, who has previous experience of chairing Rugby Football Union appeal hearings, a Swiss sports lawyer, its own solicitor James Bonnington and a representative from external lawyers Charles Russell. Rooney had previously admitted the kick was "stupid" but maintained that the ban was "a bit harsh". The striker, who has scored 28 goals in 73 appearances for England, was not included in the 1-0 friendly wins over Spain and Sweden in November. But Capello has said his most prolific forward will appear in subsequent friendlies in the new year, with one organised against the Netherlands at Wembley on 29 February. BBC pundit Mark Lawrenson said he expected Capello to select Rooney for Euro 2012. "England will now obviously take Wayne Rooney but I always thought they would - that question was like asking Argentina would they take Lionel Messi to the World Cup in similar circumstances. Of course they would," he said. 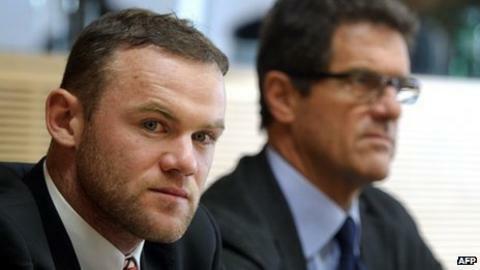 "Rooney's presence will be a lift to Fabio Capello and the other players. If they go into that game against Ukraine needing a win or a draw to go through they can call on him - and the fact that he is there might just inspire some big performances in the first two games from players who don't want to get left out of the third one. "It's really good news for England and Capello and I think the right level of punishment has been reached in the end. "I always wonder when Uefa give a three-game ban whether they are actually leaving leeway for an appeal and then room for them to reduce it." Manchester United will play in the Europa League after being knocked out of the Champions League, but a Uefa spokesman said the suspended third game of his ban could not be invoked by a dismissal for his club. If Rooney was sent off for violent conduct at Euro 2012, he would miss the following two matches - one automatic game for a dismissal, plus another invoked under the current suspension. So for example, he would be out of the semi-final and final should he be dismissed for violent conduct in any quarter-final game.